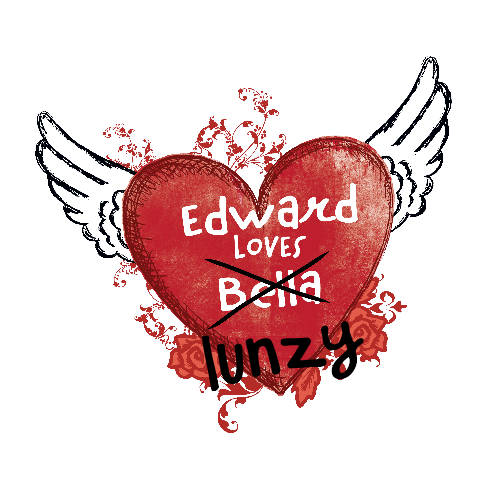 Lunzygras: Total Eclipse of the non-beating heart. Total Eclipse of the non-beating heart. Back in November I harassed my friends to no end about going to the New Moon midnight premiere. "Really guys?? A midnight showing for that?? And you have on matching shirts?! Bwwahaha!" Tonight is the night many of us have been waiting for. The midnight premiere of The Twilight Saga: Eclipse. [insert teenybopper-esque squealing and clapping and a little jumping] Not only will I be attending the premiere, my group is seeing a triple feature with Twilight and New Moon beforehand. We have our matching t-shirts it wasn't planned, pinky promise, and I'm the purveyor of Volturi body shimmer (see photo-- long skinny box on the right side; Thanks R.B.!). I really can't make this stuff up. 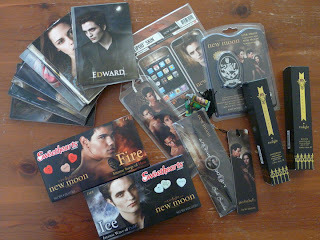 surprise New Moon goody box from one of BigDaddy's friends! You are way tooooooooooooooo funny about this. But the author never imagined her dreams literally would take her this far. Madge- they are vegetarians, not too much blood. ;) It was the best time I've ever had watching a movie(s). so. much. fun!